Kolkata, Congress leader Shashi Tharoor on Saturday termed as “frivolous” the criminal defamation complaint filed by the BJP against him in a Delhi court and alleged that it was an attempt to “throttle the freedom of expression”. Delhi BJP leader Rajeev Babbar filed the complaint against Tharoor’s alleged “scorpion” remark against Prime Minister Narendra Modi and said his religious sentiments were hurt by the statement. 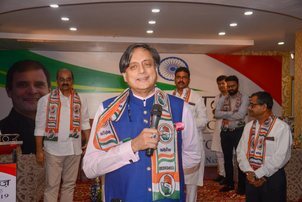 Tharoor had stoked a fresh controversy Sunday while speaking at Bangalore Literature Festival, claiming that an unnamed RSS leader had compared Modi to “a scorpion sitting on a Shivling”. Tharoor said he had quoted an article published in a magazine in 2012 in which a comment of an unnamed RSS leader had been mentioned. “So why has this defamation suit been filed against me now? In my book, I as a writer had quoted 5,000 other examples and stories,” he said. “The fact is that environment of free expression, the liberty to quote what has been said at one time or another about prominent political personalities in a respectable publication (is not wrong). As far as I am concerned, if we start stifling the right of people to quote published material then where does our democracy head ?” he said. “I have also quoted Mr Modi’s authorized biography by Andy Marino quite extensively. So it is not as if the 500-page book can be reduced to one line which this particular complainant doesn’t like,” Tharoor, also a writer and former diplomat, said. “I am surprised to hear about the defamation suit. I hope the judge will throw it out on the grounds that this is the actual fact. But if not then certainly we have to defend it,” he asserted.